IBPS RRB Notification 2019: IBPS RRB Office Assistant and Officers Scale I, II & III vacancies. Interested and eligible aspirants can apply for the IBPS RRB Recruitment 2019. Visit the official website to apply online. The IBPS RRB Online Application 2019 will be Releases soon. The IBPS RRB 2018 online application activated from 8th June 2018. 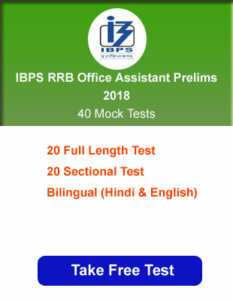 The IBPS RRB 2019 examination for the recruitment for the post of Office Assistant is divided into two level, i.e. Prelims and Mains examination. And for the post of Officers scale I the recruitment process in consist of three level Prelims, mains and interview. While for the post of Officers Scale II & III would be taken into two-phase Single examination and Interviews. Scroll down to more brief descriptions of IBPS RRB Office Assistant and Officer vacancies. IBPS RRB Office Assistant 2018 and Officer Scale I, the Preliminary Examination will conducts on 09/09/2018, 10/09/2018, 16/09/2018, 17/09/2018, 23/09/2018 and 24/09/2018. The Main Examination for Office Assistant will conducts on 12/11/2018 and Officer Scale I is on 05/11/2018. Single Exam will conducts for IBPS RRB Officer Scale-II & III on 05/112018. A Candidate must be either – a Citizen of India or a subject of Nepal or a subject of Bhutan or a Tibetan Refugee who came over to India before 1st January 1962 or a person of Indian origin who has migrated from other countries above shall be a person in whose favour a certificate of eligibility has been issued by the Government of India. For Officer Scale-III (Senior Manager)– Above 21 years – Below 40 years i.e. candidates should not have been born earlier than 03.06.1978 and later than 31.05.1997 (both dates inclusive). Online payment will be available from 08/06/2018 to 02/07/2018. General Category candidates have to pay application fee of 600/-. SC/ ST/ PWD category candidates have to pay 100/- as application fee. Syllabus and Exam pattern is almost same for IBPS RRB Assistant and IBPS RRB Officer Posts. An additional section of professional knowledge will be asking for Specialist officer Grade – II. How to Apply for IBPS RRB Recruitment? Visit the official website of IBPS – www.ibps.in. Click on the Home page to open “CRP for RRBs” link. Choose the desired post link either of Office Assistant or Officer Cadre. The link will get re-direct to the registration page. Now click on “CLICK HERE FOR NEW REGISTRATION” to register. Enter the basic information in the Online Application Form. Provide the valid email id and mobile number. The Registration Number and the password will be generated and also sent to the registered mobile number and email id. And a Hand Written Declaration as follows, the handwritten declaration should be only in English and should be written only by the appropriate candidature. No modifications are entertained after “Final Submission” so the candidates are advised to verify the details before submission. The application form is integrated with the payment gateway and payment process. Pay the application fee/ Intimation charges online. If the transactions are not successful the candidates have to log in again with the provisional registration number and password. On successful completion of the transaction, an e-receipt will generate. Take the printout of the e-receipt and online application form online. RRB will releases Admit Card 15 days before the IBPS RRB Exam. The candidates need to visit the official website. Log in using the registration number and the date of birth to download IBPS RRB Recruitment Admit Card. The IBPS RRB Recruitment 2019 will declare the result after 2 to 3 months of the exam conducted. Candidates need to login to the official website of IBPS – ibps.in to check their results. Log in using the registration number and password to check their result. Institute of Banking Personnel Selection conducts the Rural Bank Selection for the posts of Office Assistant and Officer Cadre. The IBPS RRB Recruitment will be based on the requirement of the bank. The interested candidates can ensure their eligibility before the application process. The detailed description on the IBPS RRB Recruitment about the educational qualification and age limit are provided. The candidates will get select through their performance in the Written Examination and Personal Interview. The written examination will be based on the Preliminary Examination and Main Examination. For the Officer Scale-II & III, the single Examination will be conducted. Pay the Application fee for IBPS RRB Recruitment online. Apply for the desired post before the closing date of the online application.